In an attempt to read more, I've started Unplug and Read—you can read my introduction here. I'll hopefully have more than one book to talk about this month, but we'll take things day by day. I'll just go ahead and say it right now: this book was amazing. 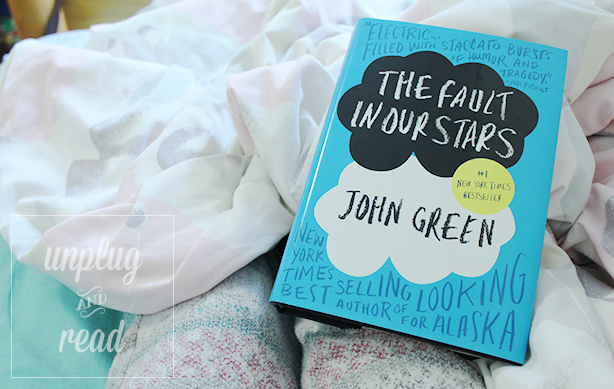 I have heard about John Green for quite some time now, but I never thought about purchasing any of his books. I don't know why I didn't, but I'm so glad that something in my head told me to. I finished this book in a couple of days during the summer, but it sat in my heart for much longer. The Fault in Our Stars (TFiOS, for short) is about a 16-year-old cancer patient named Hazel who attends a support group and ends up falling in love with a boy named Augustus Waters. Although TFiOS is a simple story, it did an incredible job of pulling at all my heartstrings. Cancer is a tough subject to read about, but John Green knew all the right ways to make me laugh, smile and, of course, tear up. It was Hazel and Augustus' journey toward falling in love and the way Hazel thinks that made me want to continue reading. John Green was witty and bold, not to mention someone with a large vocabulary. (I was literally searching the dictionary throughout every page.) If you are someone who has a hard time finding a good book to read, I highly suggest The Fault in Our Stars. Also, I heard there is a movie coming out in 2014. Hopefully it will be just as good as the book!